It was a clear, frosty morning, and I was thinking of standing stones. A couple of days previously I had driven over to Holy Island, aiming to clear my mind of the recent American election results, as well as visit the Penrhos Feilw standing stones (more on these some other time). As I looked at the photos from there I realised to my shame that I hadn’t photographed the nearest standing stone, which I drive past regularly: the megalith in Llanddyfnan. So this morning was a good time to take a quick trip up the road with my camera. This single standing stone is just beside the road between Pentraeth and Talwrn, close to the Llanddyfnan parish church and its neighbouring Ty’n Llan farmhouse. The Stone Science museum is across the road. I got some nice photos of a well-lit monument, plus some of a herd of curious cattle who ran over to the fence, either to see what I was up to, or to see if I was bringing their feed. I then went over to the church, which I had photographed before, but several years ago. After a few shots of the church I began wandering around the graveyard, mindful that some of the people I mentioned in my recent blog about the abandoned house, Ynys, at Cors Bodeilio might be here. Sure enough, two prominent slabs near the church door were for the Thomas family of the Bodeilio estate, including Evan Rice Thomas, who died 20 August 1875. 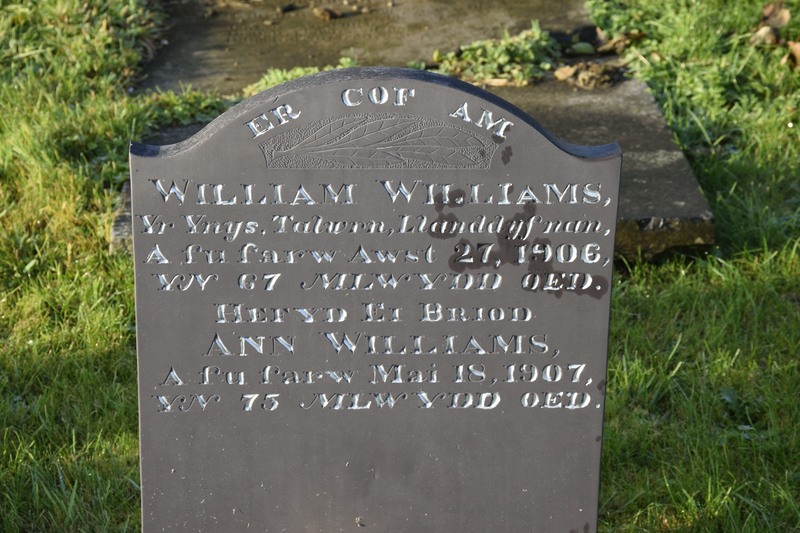 Back by the wall was the grave of William Williams, the last recorded resident of Ynys, who died in 1906, and his wife Ann, who died the next year. 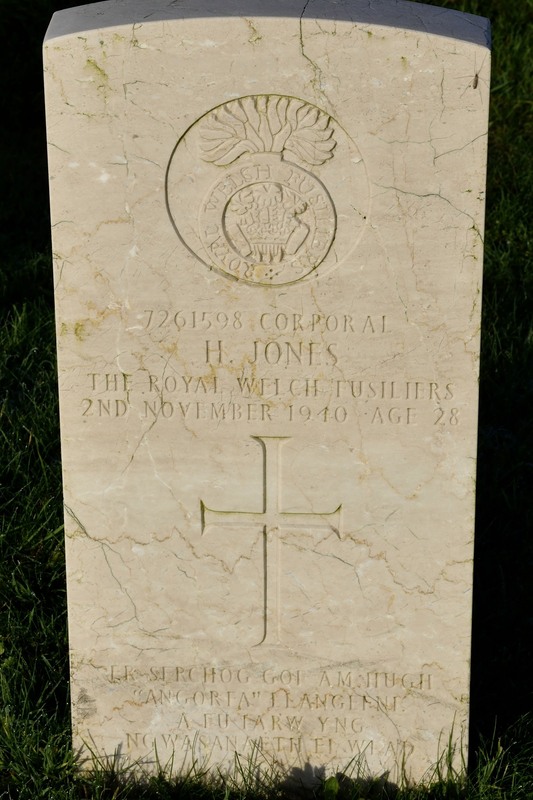 A few other interesting stones were spotted, including a Commonwealth War Grave stone for Corporal H. Jones of the Royal Welch Fusiliers, who died in November 1940, aged 28. I stood by his grave for a moment in advance of the minute silence later in the morning for Armistice Day. But the real surprises were to be found in the newer section of the cemetery. I spotted a grave with a number of plants and flowers around it, and a familiar name. Ann Benwell was a prominent local historian, a retired university lecturer, devoted member of the Anglesey Antiquarian Society and trustee of Menai Heritage, of which I am also a trustee. She died suddenly in 2013. I was surprised to find her here in Llanddyfnan, as she had lived in Menai Bridge, and I didn’t know of any connection to the parish. I’ve since learned she grew up near Talwrn. I was further surprised when I looked at the grave next to Ann’s. 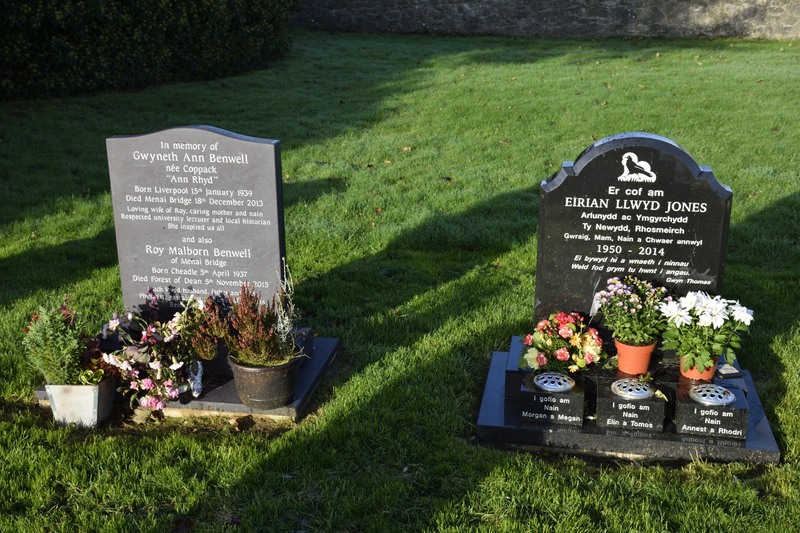 This was for Eirian Llwyd, a well known local artist and wife of former Anglesey MP, AM and Plaid Cymru party leader, Ieuan Wyn Jones. She died after a short battle with cancer in 2014. I met her a couple of times a few years ago when I bought two of her prints, which hang proudly in my house. One of these prints is of a raven, so I was touched to see her gravestone also features a raven, a bird that appears in a number of her artworks. It must have had special significance to her, perhaps because of the association with the figure from the Mabinogion, the giant Welsh king Brân the Blessed, brother of Branwen. As I mentioned in my last blog, The Irishman in Church Island Cemetery, every graveyard has several interesting stories to tell, if you just look closely.